As a child, this was my favorite bible story. I’m not sure why. I guess I just always liked the idea of this huge ziggurat reaching to the heavens. Come to think of it, this story may well have prepared me for Ayn Rand’s Fountain Head. This story is interesting for so many reasons. Mankind was so unified in purpose, they began to become God-like. The Lord sees this, assumably feels threatened by it and effectively retards mans technological abilities by confounding their language and scattering them to the four corners of the earth. Taken as a story, it’s strangely compelling. Not only does it serve to explain the origin of the earth’s myriad of languages, it attempts to teach a lesson at the same time. “Know your place”. -It’s difficult to believe that an ancient civilization had the technical savvy, or manpower to construct a tower so high that its “top may reach unto heaven”. I’m certainly open to the idea, after all, the Pyramid of Giza is a testament to what a civilization can do with enough money, time and slave labor. The thing is, the Pyramid of Giza is still standing. 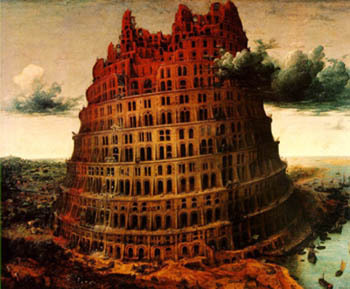 The Tower of Babel is not. In fact, there’s no hard evidence that outside of your everyday ziggurats, it ever existed at all. -There is no definitive linguistic or evolutionary evidence that a single language was the origin of all other languages. Or, as this story suggests, a single, all encompassing, unified language existed before God fractured it. We, as mankind, have surely made structures much larger than the original Tower of Babel. If the Lord feels threatened by this development, he hasn’t made a mention of it. That’s not to mention our adventures with nuclear fission and space exploration. It’s also interesting to note that the notion of “one language” is quickly being accepted as standard operating procedure for all mankind. OK, I’ll sign off now, I’ve found that I’ve been babbling a bit.